This semester we had some great entries to the video contest and here are the first and second place winners. Eric Formato won $300 for his video and Becca Kopcie won $200 for hers. Thanks for the videos guys! In the past few months, Duquesne’s President has been the center of increased media attention. While some may disagree with decisions of his recently, it’s hard to argue against the progress Duquesne has made under Dougherty’s tenure. earned its first Leadership in Energy and Environmental Design (LEED) Silver Rating (for the new Power Center) and LEED Gold Rating (for renovations to the Duquesne Union) from the U.S. Green Building Council. For many students, the President is someone they may never meet during their time at school, but the Duquesne Duke recently ran a two part feature on Dougherty that helps to bridge the gap between students and the Administration. The University expanded its campus, acquiring in January 2004 the Citiline Towers apartment building, now called Brottier Hall. Duquesne went on to purchase land along Forbes Avenue where it constructed the Power Center, which opened in January 2008 and was later certified by U.S. Green Building Council. Since then, the University has acquired a number of buildings along Fifth Avenue. It’s easy to agree, the campus has greatly improved in the past few years and it’s also clear that the Administration and Dougherty plan to continue that trend. Click to read about Duquesne’s Strategic Plan for the next five years. Recently Associate Dean, Dr. Evan Stoddard, and his honors college class completed a community service project at the Hazelwood YMCA. 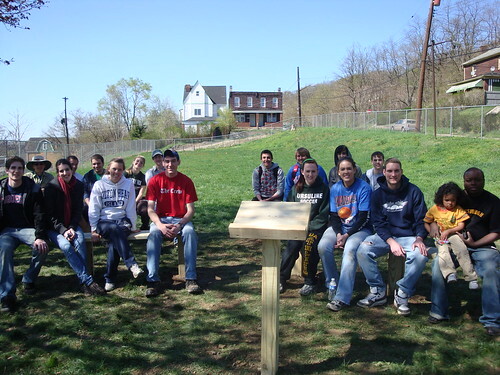 Together, they helped to build an outdoor classroom. 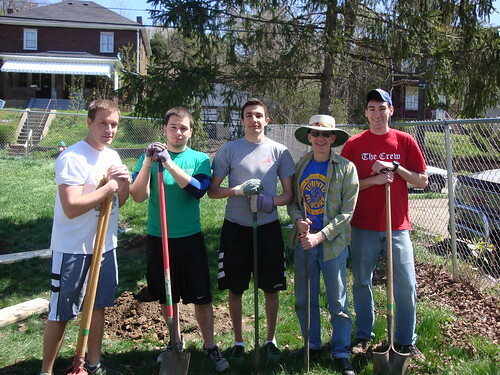 The Honors College devotes a semester every year to a neighborhood-based service project, and the students contribute their results as a gift to the neighborhood. In getting to know the neighborhood, the students researched it and spent hours at a time for several weeks walking around, talking to merchants and preachers and people on the street, attending meetings and going to church. In their class summaries, several wrote that the experience made them a little more worldly. “This class has opened my eyes a lot more to the world around me that I normally don’t see,” said Kyle Wiltsey. “I feel that I have a much greater awareness of the situations and conditions that disadvantaged people in poor communities have to deal with,” wrote Spencer Heaps. This was a great project and will surely be a great addition to the YMCA! 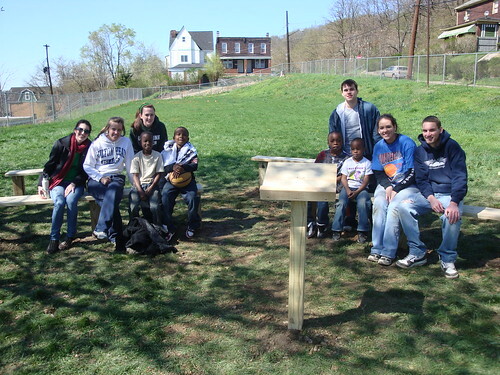 You can learn more about service learning at Duquesne here and more on the Honors College here. 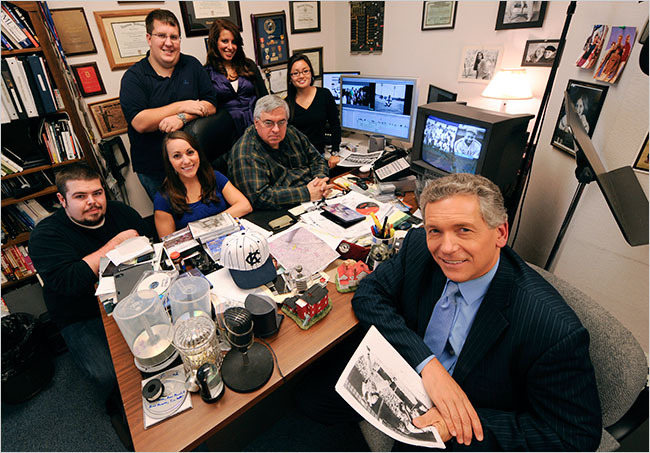 All the accompanying photos are courtesy of Dr. Stoddard. Congrats to all the graduates and good luck in the future! Time really does fly. Yesterday seriously feels like the first day of high school and I’m already done with my freshman year in college. Of course I’m excited for the summer, but there is a bit of bitter sweet feelings in the air. All the work is over, but another year in gone in my life. As corny as this sounds when you stop and think, you realize how fast time really goes. Most people go through life not truly appreciating every day. People are too busy with school, work, jobs, and feel too stressed out to enjoy each and every day. They wish for weekends, summers, vacations without appreciating every day. Everyone is looking to live in the future, but the present is where we should be living. Time is too valuable to throw away. Confucius once said, “Do not dwell in the past, do not dream of the future, concentrate the mind on the present moment.” There are obviously going to be bad days at times you can’t wait for a new day, but make sure it does not become a pattern. The future is an exciting time especially since college is setting us up for a successful future, but just remember to take one day at a time. College is meant to be some of the most exciting years of our life, so don’t waste them. Have a GREAT SUMMER!